The Kitchen Garden is located in Sunderland,MA. Tim Wilcox and his wife, Caroline Pam, grow a diverse set of organic vegetables on their 25-acres of organic farmland in the Pioneer Valley. 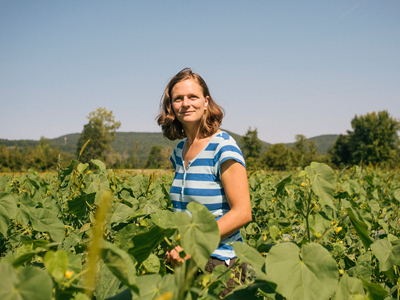 The couple met at the Union Square Greenmarket in NYC, but decided to start farming in central Massachusetts where the rich river bottom soil is ideal for supporting small sections of different types of crops. They received organic certification in 2014 and the Boston Organics Community has enjoyed eating Tim and Caroline’s bok choy, cucumbers, kohlrabi and snap peas since 2015.